Did you know Jetpack has a development mode? Until recently, I didn’t. While Jetpack is in development mode, features that do not require a connection to the WordPress.com servers can be activated and used on a local WordPress environment for testing and debugging. To activate Jetpack’s development mode, you’ll add the snippet below to your wp-config.php file. You’ll want to make sure that you add it before the /* That’s all, stop editing! Happy blogging. */ line. Jetpack’s development mode is automatically enabled if you local installation’s hostname doesn’t contain a period, i.e. localhost. If you use a different URL, such as what I do when running a local development environment, like daharveyjr.dev for instance, then the JETPACK_DEV_DEBUG constant needs to be defined in order to activate development mode. 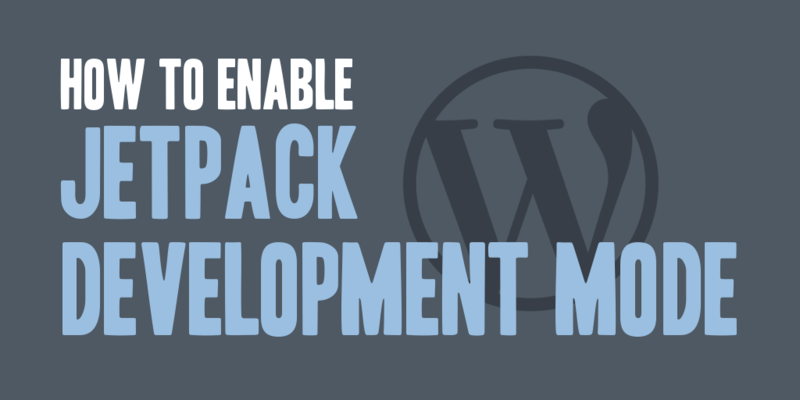 NOTE: While using Jetpack’s development mode features that require a WordPress.com account will not be available at all, features such as: Related Posts and Publicize. Other features may have reduced functionality to give developers a valid, working representation of the feature. Enabling development mode doesn’t work at all for me. With or without JETPACK_DEV_DEBUG (on my http://localhost, which according to the above, defaults to dev mode), it just plain doesn’t work – never invokes any of the filters in after-the-deadline.php, so nothing happens on an admin-ajax call. Larry, I would make sure you’ve defined the JETPACK_DEV_DEBUG constant in the wp-config.php file. I’ve also enabled this on local development sites, and have not seen it fail if defined in the correct place. However, if that doesn’t work, there are other options to enable development mode that you could test against as well.